This article is about the business model for making integrated circuits. For other uses of the term foundry, see foundry (disambiguation). In microelectronics, the foundry model refers to the separation of a semiconductor fabrication plant operation (foundry) from an integrated circuit design operation, into separate companies or business units. Although many companies continue to both design and manufacture integrated circuits (achieving efficiency through vertical integration), these integrated device manufacturers (IDMs) are not alone in the marketplace. Economic forces have led to the existence of many companies that only design devices, known as fabless semiconductor companies, as well as merchant foundries, or Pure Play foundries that only manufacture devices under contract for other companies, without designing them. Examples of IDMs are Intel, Samsung and Texas Instruments, examples of fabless companies are Qualcomm, Broadcomm, Nvidia, AMD, and examples of Pure Play foundries are TSMC, Globalfoundries and UMC. Integrated circuit production facilities are expensive to build and maintain. Unless they can be kept at nearly full utilization, they will become a drain on the finances of the company that owns them. The foundry model uses two methods to avoid these costs: fabless companies avoid costs by not owning such facilities. Merchant foundries, on the other hand, find work from the worldwide pool of fabless companies, and by careful scheduling, pricing, and contracting keep their plants at full utilization. Originally, microelectronic devices were manufactured by companies that both designed and produced the devices. This was necessary because manufacturing involved tweaking parameters, precise understanding of the manufacturing processes being used, and the occasional need to redesign. These manufacturers were involved in both the research and development of manufacturing processes and the research and development of microcircuit design. However, as manufacturing techniques developed, microelectronic devices became more standardised allowing them to be used by more than a single manufacturer. This standardization allowed design to be split from manufacture. A design that obeyed the appropriate design rules could be manufactured by different companies that had compatible manufacturing methods. An important development that allowed this was the introduction of advances in electronic design automation (EDA), which allowed circuit designers to exchange design data with other designers using different foundries. Because of the separation of manufacture and design, new types of companies were founded. One type of company is called a fabless semiconductor company. These companies do not have any semiconductor manufacturing capability but rather contract production from a manufacturer. This manufacturer is called a merchant foundry. The fabless company concentrates on the research and development of an IC-product; the foundry concentrates on fabricating and testing the physical product. If the foundry does not have any semiconductor design capability, it is called a pure-play semiconductor foundry. An absolute separation into fabless and foundry companies is not necessary. Some companies continue to exist which perform both operations and benefit from the close coupling of their skills. Some companies manufacture some of their own designs and contract out to have others manufactured or designed, in cases where they see value or seek special skills. The foundry model is a business vision that seeks to optimize productivity. The very first merchant foundries were part of the MOSIS service. The MOSIS service gave limited production-access to designers with limited means, such as students, researchers at universities, and engineers at small startups. The designer submitted designs and these submissions were manufactured with the commercial company's extra capacity. Manufacturers could insert some wafers for a MOSIS design into a collection of their own wafers when a processing step was compatible with both operations. The commercial company (serving as foundry) was already running the process, so they were effectively being paid by MOSIS for something they were already doing. A factory with excess capacity during slow periods could also run MOSIS designs in order to avoid having expensive capital equipment standing idle. Under-utilization of an expensive manufacturing plant could lead to the financial ruin of the owner, so selling surplus wafer capacity was a way to maximize the fab's utilization. Hence, economic factors created a climate where fab operators wanted to sell surplus wafer-manufacturing capacity, and designers wanted to purchase manufacturing capacity rather than try to build it. Although MOSIS opened the doors to some fabless customers, earning additional revenue for the foundry and providing inexpensive service to the customer, running a business around MOSIS production was difficult. The merchant foundries sold wafer capacity on a surplus basis, as a secondary business activity. Services to the customers were secondary to the commercial business, with little guarantee of support. The choice of merchant dictated the design, development flow, and available techniques to the fabless customer. Merchant foundries might require proprietary and non-portable preparation steps. Foundries concerned with protecting what they considered trade secrets of their methodologies might only be willing to release data to designers after an onerous nondisclosure procedure. In 1987, the world's first dedicated merchant foundry opened its doors: Taiwan Semiconductor Manufacturing Company (TSMC). The distinction of 'dedicated' is in reference to the typical merchant foundry of the era, whose primary business activity was building and selling of its own IC-products. The dedicated foundry offers several key advantages to its customers: first, it does not sell finished IC-products into the supply channel; thus a dedicated foundry will never compete directly with its fabless customers (obviating a common concern of fabless companies). Second, the dedicated foundry can scale production capacity to a customer's needs, offering low-quantity shuttle services in addition to full-scale production lines. Finally, the dedicated foundry offers a "COT-flow" (customer owned tooling) based on industry-standard EDA systems, whereas many IDM merchants required its customers to use proprietary (non-portable) development tools. The COT advantage gave the customer complete control over the design process, from concept to final design. Pure-play semiconductor foundry is a company that does not offer a significant amount of IC products of its own design, but instead operates semiconductor fabrication plants focused on producing ICs for other companies. Integrated device manufacturer (IDM) semiconductor foundry is where companies such as Texas Instruments, IBM, and Samsung join in to provide foundry services as long as there is no conflict of interest between relevant parties. Like all industries, the semiconductor industry faces upcoming challenges and obstacles. The cost to stay on the leading edge has steadily increased with each generation of chips. The financial strain is being felt by both large merchant foundries and their fabless customers. The cost of a new foundry exceeds $1 billion. These costs must be passed on to customers. Many merchant foundries have entered into joint ventures with their competitors in an effort to split research and design expenditures and fab-maintenance expenses. Chip design companies sometimes avoid other companies' patents simply by purchasing the products from a licensed foundry with broad cross-license agreements with the patent owner. Stolen design data is also a concern; data is rarely directly copied, because blatant copies are easily identified by distinctive features in the chip, placed there either for this purpose or as a byproduct of the design process. However, the data including any procedure, process system, method of operation or concept may be sold to a competitor, who may save months or years of tedious reverse engineering. ^ Suzanne Berger; Richard K. Lester (12 February 2015). Global Taiwan: Building Competitive Strengths in a New International Economy. Routledge. pp. 142–. ISBN 978-1-317-46970-4. ^ Hitoshi Hirakawa; Kaushalesh Lal; Shinkai Naoko (2013). Servitization, IT-ization and Innovation Models: Two-stage Industrial Cluster Theory. Routledge. pp. 34–. ISBN 978-0-415-63945-3. ^ McGrath, Dylan (2017-01-23). "X-Fab is Fastest Growing Foundry". EE Times. Retrieved 2017-05-10. ^ "RBK Data base of companies". rbc.ru. Retrieved 20 February 2018. ^ "United States dollar (USD) and Russian ruble (RUB) Year 2014 Exchange Rate History". Retrieved 20 February 2018. ^ semimd.com: 2011 Major IC Foundries. ^ dongbuhitek.com: 2010 Foundry Ranking (citing Gartner) (PDF). ^ IC Insights, "2009 Major IC Foundries" March 2009. ^ IC Insights, "Leading Pure-Play Foundry Companies" March 2009. 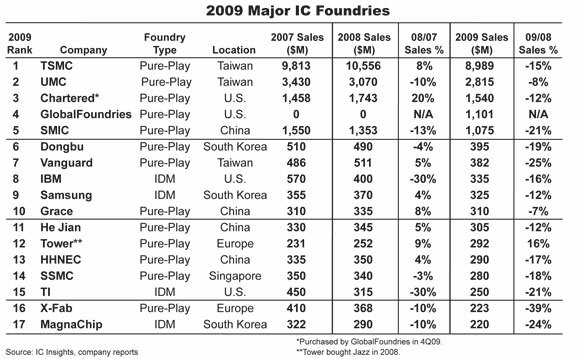 ^ IC Insights, "2007 Major IC Foundries". ^ IC Insights, "Worldwide 2006 Top 25 Semiconductor Sales Leaders". ^ R. H. Abramson (28 Feb – 4 Mar 1994). "When the chickens come home to roost: the licensed foundry defensein patent cases". Compcon Spring '94, Digest of Papers. : 348–354. doi:10.1109/CMPCON.1994.282907. ISBN 978-0-8186-5380-3. ^ Carol Marsh and Tom Kean. "A Security Tagging Scheme for ASIC Designs and Intellectual Property Cores". Design & Reuse. Compound Semiconductor.net: "Foundry model could be key to InP industry future"
This page was last edited on 11 April 2019, at 05:37 (UTC).